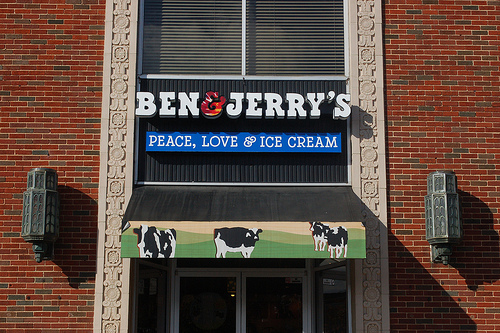 During my family’s recent trip to Tennessee, I had an opportunity to pass through Chattanooga and spotted a Ben & Jerry’s store there. I had never seen a stand alone Ben & Jerry’s store like this before, and as the Sweets Reporter I felt compelled to step in and try some tasty sweets. The menu had a large selection of ice cream flavors (over 25), a few yogurt flavors, sorbet, sundays, shakes, and even smoothies. I quickly decided on having “Coffee, Coffee Buzz Buzz Buzz!” flavor, which I had been wanting to try ever since spotting it on their website a few weeks back. My wife and kid shared a “Berry Nice” smoothy. The coffee ice cream was somewhat of a disappointment. From the title I was expecting more coffee, or at least more caffeine, but found neither. This flavor is supposed to be “coffee ice cream with espresso bean fudge chunks”, but the coffee flavor wasn’t particularly prominent (coffee was 7th ingredient on the label) and the chunks, of which there were far too many, tasted like everyday chocolate chips. It didn’t exactly taste bad but didn’t live up to my expectations either, especially considering it has such a great title. I would recommend Talenti’s Coffee Chocolate Chip (which I reviewed here) for an overall better flavor and better balance of chocolate chips. The Berry Nice smoothy, another product with a well thought out name, was very tasty with blueberries, pomegranate, strawberries and banana mixed with sorbet. The biggest drawback was the many seeds which were cumbersome to chew, though they indicated there was a good proportion of real fruit. Having said that, I’d like to see the actual ingredient list to see if there was more sorbet than fruits. I regret not writing down the prices (nor taking pictures since I didn’t have my camera at the time – need to buy a smaller camera), but from what I remember the ice cream was around $3.50 for a small size and the smoothy was a bit over $5 for the smaller size. Of the two I consider the smoothy, which is made from fresh fruits, a much better deal, especially since you can get the same ice cream for much cheaper by buying pints at a grocery store. The only exception is when the flavor you want to try isn’t sold near you (which happened in my case with the coffee ice cream). Still, its a great place to grab some sweet goodness with a group of friends, and the large menu assures everyone will be satisfied. The service was very friendly and considerate as well, tolerating several children running around the place without a complaint or even a negative expression. Also when they were out of cups for the small smoothy they gave us a large sized cup and filled it up to the top, without any extra charge. Their website has a store locator, and it appears that there a bunch of these stores all over the country, so be sure to check if there is one in your area. If you search for “Miami” using it you’ll actually see a few Royal Caribbean cruise ships show up. If I ever sail on one of those I’ll like try one of those fruit smoothies again.